The external ports are switched on or off (including infrared interface, audio source selection interface, volume motor control interface, volume key interface, standby control interface). Switch the clock display effect. UP+DOWN+OK -2 Seconds，Enter the screen self-test program, press the OK button 1 second to exit. UP+DOWN+OK -10 Seconds，Infrared code recovery factory settings (the default is Tmall infrared remote control). (Note, if you need to increase to the brightest level, press for about 10 seconds, if the standby brightness is too high, it will cause uneven of VFD, the highest brightness level is not recommended). UP - Hours / minutes / sec / year / month / day increase. DOWN - Hours / min / sec / year / month / day decrease. 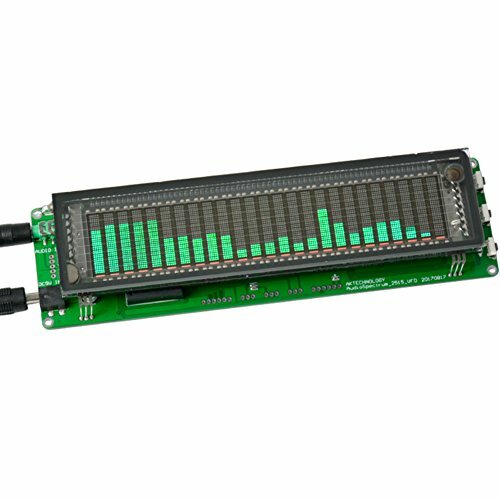 1.Dedicated VFD spectrum display, Resolution 25 X 15.Support 32HZ-16KHZ frequency sweep , Ensure the accuracy of each band. 2.The falling speed of the light bar, the holding time and the falling speed of the peak can be adjusted separately. 4.Different colors of light alone provided a current limiting resistor. Guarantee a perfect match. 5.Accurate clock display function (This function is entered after 10 seconds without signal input and key operation）. （SD2405AL built-in crystal oscillator, the chip can ensure that the clock accuracy is + 5ppm (at 25 + 1 degrees Celsius), the annual error is less than 2.5 minutes.Note:if you don't know how to connecton it,pls tell us,we can send a youtobe video for you.